Martial arts dojo teaching women’s self defense, karate, traditional weapons, firearms training, aikido, and yoga. Serving the South Bend / Mishawaka area since 1965. Trial and new student programs available! 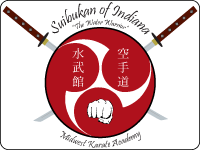 We are the 3rd generation of Midwest Karate Academy, a martial arts school in South Bend, IN. The Dojo was founded by Hanshi Tadashi Yamashita and Sensei James Ninios over 50 years ago. Hanshi Tadashi Yamashita teaches karate that is dynamic and flowing, like waves crashing on the shore, and from that, his own style, Suikendo. We defend and attack with constant movement, to and from one technique to the next, continually directing power, energy and speed toward the opponent. New students are welcome to try 3 trial classes at no charge! Over 400 years of history ties our school directly to the island of Okinawa.